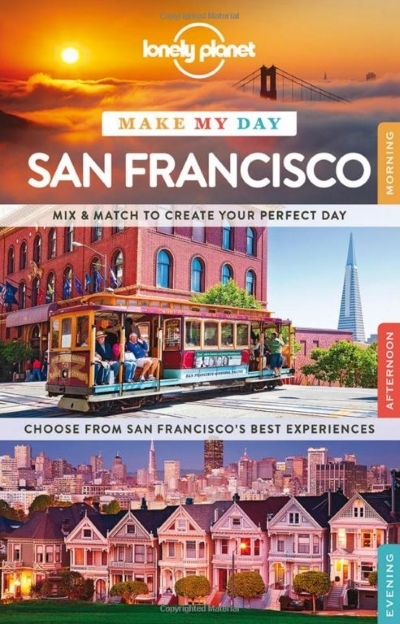 The Perfect Day in San Francisco is what's promised by the new guidebook from Lonely Planet in their Make My Day series, but does it deliver? Sometimes you look at a guidebook which has a new design that you've never seen before, and you immediately think 'gimmick'. 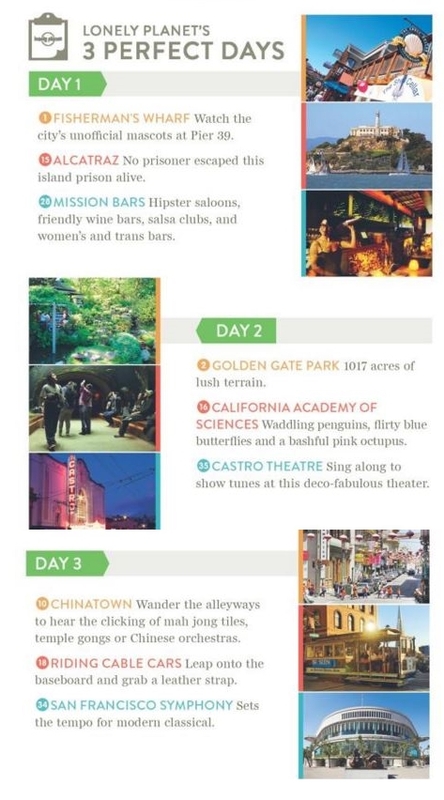 That was certainly the first impression with this San Francisco title in the new series of 'Make My Day' guides from Lonely Planet, which promises to help you 'Mix and match your perfect day' as you 'choose from San Francisco's best experiences'. 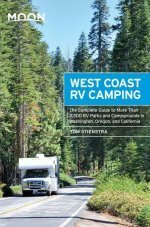 'Gimmick' was the first impression but then the longer you spend using this guidebook the more you realize how cleverly it's done, and that for some people – first-time visitors in particular, with limited time – it could be a good investment. So what is this new design? Well, the bulk of the book, which doesn't even have page numbers, consists of pages that have been cut horizontally into three. Each page has a recommended Morning, Afternoon, and Evening activity on it. There are 39 in all, 13 for each time of day. On the left-hand side is the name of the attraction, a photo, and a few words of description. For example, the Alcatraz Night Tour is described as 'The famous prison in a different light'. On the right-hand side are the corresponding longer descriptions of what each place is all about, a mini map, and an eating suggestion. Some also have a Top Tip or a Must See included too. Because of the size of the space, the write-ups are inevitably small: the Golden Gate Bridge, for instance, is just two sentences (although they are long sentences). So far so what, you might think. But the clever design means you can flip through any of the 13 Morning suggestions, go on to any of the 13 Afternoon suggestions, and end with any of the 13 Evening activities. Put the elasticated band around the book and you have your Perfect Day. 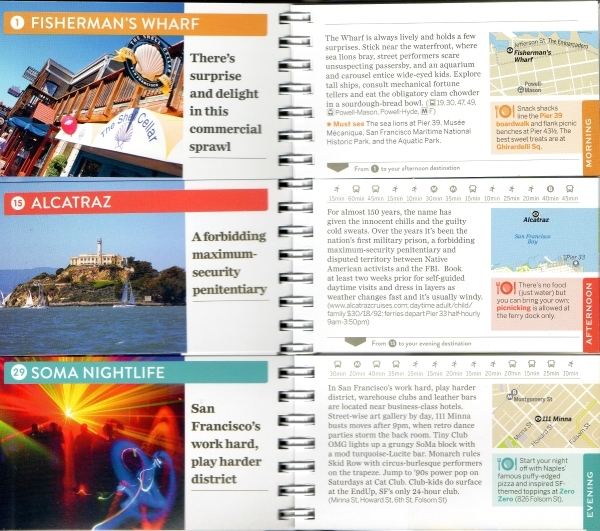 Want to go to Chinatown in the morning, ride a cable car in the afternoon, and then do the Alcatraz Night Tour? You got it. Or are you more interested in seeing the City Lights Bookstore, then the Beat Museum, and finally enjoying some Fillmore Street Jazz in the Evening? A clever little strip across the top of each right-hand entry also shows you how long it will take you to get from one activity to the next whether you're walking or using public transport. What the guide isn't detailed enough to tell you is how you get from A to B. The book does come with a big fold-out indexed street map at the back, and an overview map at the front with all 39 attractions marked. There is also a section at the back on using public transport, so you ought to be able to figure it out for yourself. And suppose you want to see Chinatown in the evening rather than in the morning? Well, that's just too bad. You can do it, of course, but the minute you start to break away from the book's suggestions, you also start to wonder if you need the book at all. 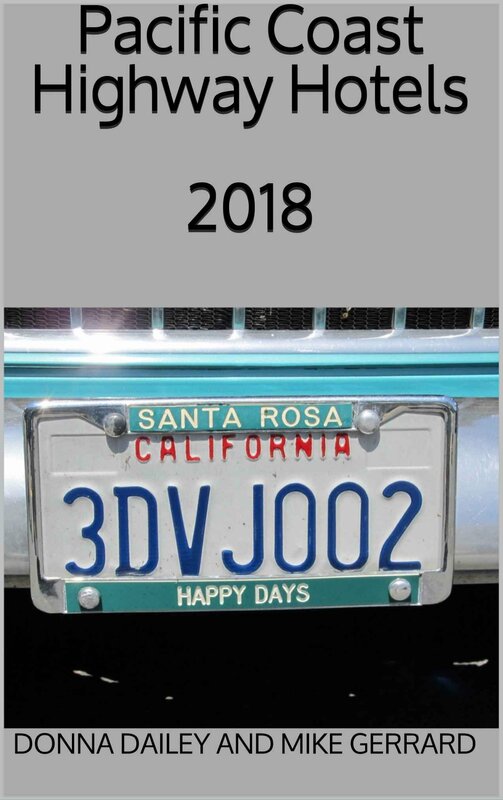 In any case the write-ups are so small that you'll probably want to buy a regular guidebook too, so why not put together your own perfect day from more than just these 39 suggestions – as good as they are? There are several plus points about the book and one is certainly the price. The book is spiral bound, uses thick card rather than paper, has both a bookmark and an elasticated page holder, and has pages cut into three in this unique design. You would expect a book like that to be very expensive to produce. But no, somehow Lonely Planet has got the US edition out at a recommended price of only $9.99, with the UK edition only £5.99. The jury's still out on this one. The book does have some good points, and is adaptable if you're in the city for maybe 1-2-3 nights and just want to see the absolute highlights. If you've been before or are going for several days, then the book probably isn't for you.